First of all, Dunfermline is a gorgeous town, as far as I can tell. 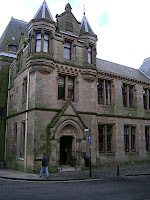 Secondly, it's home the Dunfermline Carnegie Library. Carnegie endowed £8,000 to open the library, and it is the first of many Carnegie libraries. This library is the biggest and busiest library in Fife. Among its collections it has a large local and family history collection which contains ordnance survey maps, the local paper back to 1859, the Fife county census information back to 1841, and a large number of copies of old photographs. The photographs are divided into large books and organized based on the location where they were taken. The library also contains a special collection devoted to the Scottish poet Robert Burns. This collection contains some of Burns' earliest works as well as a large sculpture of the poet himself. One particularly interesting program the librarian discussed is the bibliotherapy, or Book on Prescription program. With this program, doctors will "prescribe" a book (based on a list of approved books) that relates to the patient's ailment or treatment. The patient will take this "prescription" to the library, who has these books set aside, and the patient can check out the book to learn more. As someone who works with a patient library (that is associated with the medical library), I think this is a fantastic idea. Since many doctors don't always have a lot of time to spend with each patients and since there is such an enormous amount of health-related materials on the Internet (where credibility is almost always in question), I think it's wonderful to have specific resources for patients to go to.